We are highlighting NEMUS Bioscience, Inc. (NMUS), here at the QualityStocks Daily Newsletter. A biopharmaceutical company, NEMUS Bioscience, Inc. is centering on the discovery, development, and commercialization of cannabinoid-based therapeutics for significant unmet medical needs in international markets. A highly-qualified team of executives with decades of biopharmaceutical experience and considerable background in early-stage drug development leads the Company. NEMUS’ vision is to provide physicians and patients the medical benefits of "condition-specific" cannabinoids to alleviate symptoms associated with a range of diseases. NEMUS Bioscience is based in Costa Mesa, California. NEMUS is building a proprietary product pipeline focusing on the range from extraction processes to molecular design and unique methods of cannabinoid drug delivery to address medical needs in the multi-billion-dollar global market opportunities. The Company concentrates on discovering, developing and commercializing new chemical entities from a class of chemically diverse compounds - cannabinoids - designed to alleviate an assortment of diseases and symptoms through selectively targeting CB1 and CB2 receptors. NEMUS Bioscience signed a research agreement with the University of Mississippi (UM) in 2015. The research agreement is to study and conduct research and development on cannabidiol (CBD) containing formulations. NEMUS, employing certain proprietary technology licensed from UM, is working to develop novel ways to deliver cannabinoid-based drugs for specific indications. Its objective is optimizing the clinical effects of such drugs, while limiting the potential adverse events. The Company’s strategy will explore the use of natural and synthetic compounds, alone or in combination. NEMUS Bioscience completed the validation stage of testing of its cannabinoid-based therapy undergoing development for the treatment and management of glaucoma. The therapy, NB1111, is a proprietary prodrug version of tetrahydrocannabinol (THC) that has been shown to lessen intraocular pressure (IOP) in a rabbit glaucoma model. The compound has been in-licensed from NEMUS’ commercial and research partner, the University of Mississippi (UM). Last week, NEMUS Bioscience announced that an additional United States patent was granted covering its proprietary prodrug of THC, THC-valine-hemisuccinate (THCVHS), and other amide-ester forms of cannabinoid-based molecules, for use in the treatment of glaucoma. This second patent, also licensed to Nemus by UM, further expands the intellectual property (IP) estate into methods of delivery of THCVHS into the eye, through formulating the prodrug into a nanoparticle composition. The newly issued patent adds an additional 23 claims related to the delivery of the amide ester family of cannabinoids already covered in the patent earlier issued to UM in 2015 and in-licensed by Nemus Bioscience. THCVHS is the active pharmaceutical ingredient (API) in the Company’s glaucoma drug candidate NB1111. NEMUS Bioscience, Inc. (NMUS), closed Monday's trading session at $0.34, down 2.13%, on 247,511 volume with 64 trades. The average volume for the last 60 days is 252,496 and the stock's 52-week low/high is $0.24/$1.80. CFN Media Group, AllPennyStocks, Stockgoodies, SmallCapVoice, Cannabis Financial Network News, StocksToBuyNow, Tip.us, Money Morning, SeriousTraders, Otcstockexchange, PennyStockInformer, Whisper from Wall Street, PennyStockLaboratory, Wall Street Resources, Wall St Report, Pumps and Dumps, and TradeThesePicks reported on GrowBLOX Sciences, Inc. (GBLX), and we also report on the Company, here at the QualityStocks Daily Newsletter. GrowBLOX Sciences, Inc. is a biopharmaceutical research and development (R&D) company. Its emphasis is on creating safe, standardized, pharmaceutical-grade, cannabinoid therapies that target a variety of medical conditions. GrowBLOX Sciences is headquartered in Las Vegas, Nevada. The Company’s wholly-owned subsidiary is GB Sciences. In addition, GrowBLOX Sciences has created Growblox Life Sciences, LLC (a wholly-owned subsidiary) to pursue development of its intellectual property (IP) related to inventive cannabis-based medical compounds. GrowBLOX Sciences’ research and development team is actively pursuing new formulations derived from specific strains of cannabis, creating patented formulations that will help patients. The Company provides clean, reliable raw materials for a multitude of cannabis products and research initiatives. It is creating novel formulations and seeking patents for treatments that will directly assist patients. Last month, GB Sciences and Kush Cups signed an agreement to produce cannabis-infused products in Nevada. GB Sciences will grow the cannabis in their state-of-the-art Cultivation Labs facility in Las Vegas. It will distribute cannabis-infused Keurig-compatible K-Cups, hot and cold brew coffees, and infused teas. GB Sciences Chief Executive Officer, Mr. John Poss, said in April, "We're excited to join forces with Kush Cups. They have an excellent line of products and are the leaders in their space in Nevada. Our partnership is positioned for maximum impact in the Nevada market. It is the first major step in our strategy to be a trusted ingredient in leading brands of infused products and therapies." Last week, GB Sciences announced the retirement and resignation, effective May 8, 2017, of its Founder, Chairman and Chief Innovation Officer, Mr. Craig Ellins. Mr. Ellins is the visionary behind the Company's emphasis on pharmaceutical grade, consistent and efficacious medicines, and also much of its proprietary technology designed to produce and enhance those medicines. Today, GB Sciences announced the initial harvest at its Cultivation Lab facility in Las Vegas, Nevada. When fully operational, Cultivation Lab will house 7,200 cannabis plants, under 600 grow lights within its 28,000-sq. ft. facility. The expectation is that it will generate roughly $10 million in revenue per year. GrowBLOX Sciences, Inc. (GBLX), closed Monday's trading session at $0.259, up 2.98%, on 273,427 volume with 87 trades. The average volume for the last 60 days is 878,645 and the stock's 52-week low/high is $0.161/$0.65. 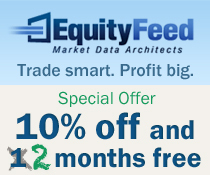 Promotion Stock Secrets, Wealth Insider Alert, Market Intelligence Center Alert, StreetAuthority Daily, Wall Street Mover, Damn Good Penny Picks, OTCtipReporter, Penny Picks, PennyStockScholar, Profitable Trader Authority, and Stock Commander reported earlier on CV Sciences, Inc. (CVSI), and today we highlight the Company, here at the QualityStocks Daily Newsletter. CV Sciences, Inc. concentrates on developing and commercializing novel therapeutics employing synthetic Cannabidiol (CBD). A life science company, it operates two divisions - Consumer Products and Pharmaceuticals. These divisions are supported by its medical and scientific advisory board, and state‐of‐the art production facilities. The Company formerly went by the name CannaVEST Corp. It changed its name to CV Sciences, Inc. in January of 2016. CV Sciences has main offices and facilities in Las Vegas, Nevada, and San Diego, California. The Company’s Pharmaceutical Division is developing synthetically‐formulated cannabidiol‐based medicine. It is pursuing the approval of the U.S. Food and Drug Administration (FDA) for drugs with specific indications utilizing cannabidiol as the active pharmaceutical ingredient. CV Sciences has achieved promising preclinical results in the development of cannabinoid medicines for the treatment of a variety of medical conditions. The Company’s Consumer Products Division delivers botanical‐based cannabidiol products that enhance quality of life. Each consumer products brand is backed by a formal safety review, a growing body of case reports, and physician’s recommendations. In addition, CV Sciences manufactures, markets, and sells plant-based CBD products under the PlusCBD brand. This is for an assortment of market sectors, including nutraceutical, beauty care, specialty foods, as well as vape. In December of 2015, CV Sciences acquired CanX, Inc. CanX is a Pre-Clinical drug development company. It is focusing on significant unmet medical needs. CanX’s initial drug candidate is CVSI-007. CVSI-007 chewing gum combines CBD and Nicotine and it is patent pending. CVSI-007 is a proprietary chewing gum that combines synthetic CBD and nicotine to effectively treat smokeless tobacco addiction. CV Sciences commenced its preclinical drug development program during Q2 of 2016, following the CanX acquisition. Its drug development efforts include pursuing synthetic-based Cannabidiol (CBD) drug candidates in areas that have the potential to provide important improvements in therapeutic patient treatments with substantial addressable markets. The latest addition to the Company’s consumer products division is Purified Liquids™ (high quality, premium CBD vape e-liquids). The launch of this brand targets the growing vape industry. Purified Liquids™ is made from 99.9 percent CBD from hemp-derived crystals and contains 0 percent THC. This month, CV Sciences announced that it will be meeting with the FDA on June 15, 2017, to discuss its initial drug candidate (CVSI-007). CV Sciences' President and CEO, Mr. Michael Mona, Jr., commented concerning smokeless tobacco addiction, "Smokeless tobacco continues to be a major health hazard and epidemic … We believe our drug candidate can have a significant positive impact on patients seeking treatment. We look forward to our meeting with the FDA, as it will be essential to the design of our clinical development program and the filing of our Investigational New Drug (IND) application." CV Sciences, Inc. (CVSI), closed Monday's trading session at $0.3075, down 0.65%, on 313,159 volume with 95 trades. The average volume for the last 60 days is 379,687 and the stock's 52-week low/high is $0.193/$0.9866. Real Pennies reported previously on Acacia Diversified Holdings, Inc. (ACCA), and we highlight the Company as well, here at the QualityStocks Daily Newsletter. Acacia Diversified Holdings, Inc. is an emerging cannabis enterprise. Its wholly-owned subsidiaries are MariJ Pharmaceuticals, Inc. (MariJ) and Canna-Cures Research & Development Center, Inc. (Canna-Cures). Via these, the Company focuses on the development of new and proprietary medicinal products for patients with USDA certified organic mobile processing and handling solutions for its customers. Acacia Diversified Holdings is based in Clearwater, Florida. The Company lists on the OTC Markets Group’s OTCQB. MariJ Pharmaceuticals’ emphasis is on the extraction and processing of very high quality, high-CBD/low-THC content medical grade cannabis oils from medical cannabis plants. MariJ specializes in organic strains of the plant. This sets itself apart from the general producers of non-organic products. In addition, MariJ has the technical expertise and capability to process and formulate the oils and to use them in its compounding operations. MariJ also has its proprietary Geotraking Technology. This technology is fully compliant with the Health Insurance Portability and Accountability standard (HIPAA), using its “plant to patient” solution. The design of the Geotraking Technology is to provide a full-channel patient care tracking system that is completely compliant under today’s strict HIPAA regulations, which require privacy and security of the patient’s information. Last month, MariJ Pharmaceuticals and Canna-Cures Research & Development Center, wholly-owned subsidiaries of Acacia Diversified Holdings, announced it successfully completed phase one of its USDA certified organic processing for Blue Circle Development and organic farm near Ft. Collins, Colorado. Acacia Diversified Holdings has its newest product line, Dahlia’s Botanicals. Dahlia's Botanicals sells endocannabinoid nutraceuticals. MariJ is the exclusive organic extraction company and Canna-Cures is the exclusive manufacturer for the Dahlia’s Botanicals line. At the beginning of May, Acacia Diversified Holdings announced that it has been invited to be part of the hemp pilot program in Tennessee through one of its new, wholly-owned subsidiaries. Mr. Richard K. Pertile, the Company’s CEO, said, "We are very excited for our shareholders and future customers of Tennessee. Having ownership in a hemp license and being part of an exciting new pilot program manufacturing USDA organic hemp oils in Tennessee is quite an exciting time. Taking steps to move more operations to the east coast is an efficient step for our Company. In addition to the Company working in a hemp pilot program in Tennessee, we are also waiting to hear about our opportunity to be awarded a low-THC, high-CBD, vertically integrated, grower's license in the state of Florida." Acacia Diversified Holdings, Inc. (ACCA), closed Monday's trading session at $1.34, down 20.24%, on 710 volume with 5 trades. The average volume for the last 60 days is 1,428 and the stock's 52-week low/high is $0.15/$2.50. 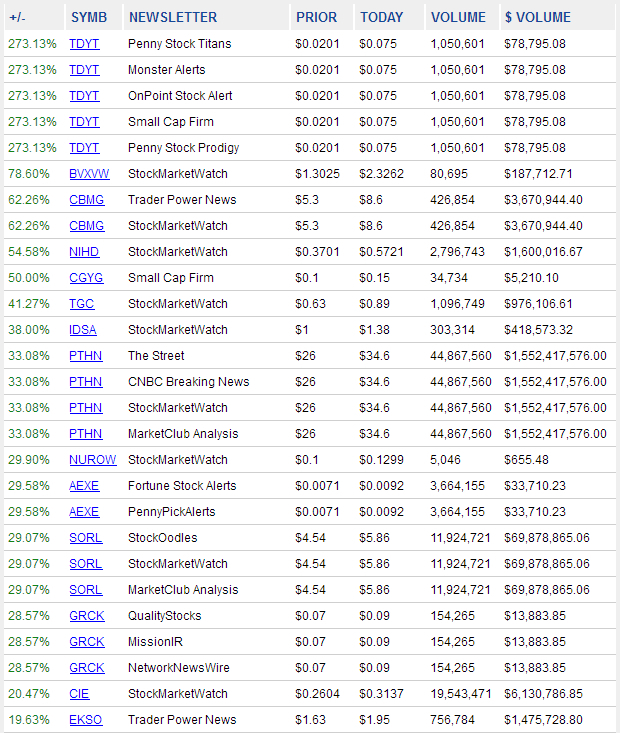 AwesomeStocks, PennyStocks24, Chatter Box Stocks, SquawkBoxStocks, Penny Pick Finders, TerrificPennyStocks, Breaking Bulls, MyBestStockAlerts, Buzz Stocks, Marquee Penny Stocks, Penny Stock Rumble, PennyStockCrowd, PennyStocksV2, and Planet Pennies reported previously on China YCT International Group, Inc. (CYIG), and today we are reporting on the Company, here at the QualityStocks Daily Newsletter. China YCT International Group, Inc is a biotechnology company whose shares trade on the OTC Markets Group’s OTCQB. The Company primarily focuses on producing medicines and selling organic healthcare products. In addition, China YCT is a significant player in the Acer Truncatum oil business. The Company anticipates that this will be a billion-dollar market in the near future. China YCT International Group has its corporate head office in Sishui, China. Furthermore, the Company’s dedication is to lay a strong foundation for building a nationwide sales and marketing network. Moreover, China YCT will be offering more incentives to strategic partners. This is to encourage them to create more value for the Company. Earlier this month, China YCT International Group announced that it signed an agreement to purchase the Acer Truncatum business from Shandong YCT Group Co. Ltd. The expectation is that this new business will increase sales by a billion U.S. dollars for China YCT in the next 5 years. Acer Truncatum is a type of maple. It has 300 species around the world. Acer Truncatum is only available in China. The Acer Truncatum oil contains 5.8 percent of nervonic acid. Previously, nervonic acid had been extracted only from killing sharks. Acer Truncatum is contained in plants, and nervonic acid can undergo extraction from these very economically. After more than 40 years’ research and experiments, the Chinese government approved Acer Truncatum oil as general wood food oil, which can be used as a general food oil, such as soybean, corn, olive, as well as other food oils. Mr. Tinghe Yan, Chairman and Chief Executive Officer of China YCT International Group, said, "We expect CYIG to become a leading Acer Truncatum oil producer and supplier in the world with billions in sales annually. We believe the new business will make CYIG a member of the billions sales club in next 5 years." China YCT International Group, Inc. (CYIG), closed Monday's trading session at $0.434, up 0.23%, on 3,000 volume with 1 trade. The average volume for the last 60 days is 3,079 and the stock's 52-week low/high is $0.046/$0.70. The QualityStocks Daily Newsletter would like to spotlight Grey Cloak Tech, Inc. (GRCK). Today, Grey Cloak Tech, Inc. closed trading at $0.09, up 28.21%, on 154,047 volume with 13 trades. The stock’s average daily volume over the past 60 days is 94,595, and its 52-week low/high is $0.025/$0.605. Grey Cloak Tech, Inc. (GRCK) is a developer of industry-leading click-fraud detection software designed to overcome the most expensive and devastating threats in the digital world. Through its recently acquired subsidiary, ShareRails, Grey Cloak now also provides sophisticated e-commerce tools that help retailers evolve beyond their brick-and-mortar business practices to increase both their digital engagement and their foot traffic. Most of today's retail sales are Web-influenced. By utilizing digital marketing channels, merchants can enhance the in-store shopping experience for customers and simultaneously boost sales. The ShareRails O2O platform enables retailers to put their product catalogs online, along with product location and availability, and make the information searchable. The platform also offers digital merchandising tools that include an outfit builder and wishlist app along with conversational shopping tools. Through ShareRails O2O, merchants can additionally tap into data that details shopper insights and behavioral trends. Add-on services include click-n-collect, reservations for in-store pickup, and local delivery. Joined together, Grey Cloak Tech's industry-leading click-fraud detection solutions and the exciting retail-boosting products delivered through ShareRails offer a broad package of services to both protect businesses in the digital world and help them utilize digital channels to bolster their sales and enhance customer engagement. The QualityStocks Daily Newsletter would like to spotlight ORHub, Inc. (ORHB). Today, ORHub, Inc. closed trading at $0.42, up 13.45%, on 27,024 volume with 18 trades. The stock’s average daily volume over the past 60 days is 188,569 and its 52-week low/high is $0.05/$2.09. The QualityStocks Daily Newsletter would like to spotlight Kootenay Zinc Corp. (KTNNF). Today, Kootenay Zinc Corp. closed trading at $0.1542, up 10.14%, on 513,870 volume with 136 trades. The stock’s average daily volume over the past 60 days is 76,198, and its 52-week low/high is $0.1197/$0.59. Kootenay Zinc Corp. (KTNNF) is a mineral exploration and development company focused on discovering large-scale sedimentary-exhalative ("SEDEX") zinc deposits. Based in Vancouver, British Columbia, the company is ideally positioned near its primary target, the Sully Property, located 18 miles east of the world-class Sullivan Mine. Ready to claim its share of the market, Kootenay Zinc is focused on its Sully Property. It comprises 1,375 hectares and overlies rocks of similar age and origin as those which host the legendary Sullivan deposit. The Sullivan mine was discovered in 1892, and is known to be one of the world's largest SEDEX deposits. Over its 100-year lifetime, Sullivan produced approximately 150 million tonnes of ore, including approximately 300 million ounces of silver, 8 million tonnes of zinc and 8 million tonnes of lead. The squeeze in zinc supplies particularly affects China, which is both the world's largest zinc consumer and its largest producer, with 4.9 million tons of output in 2015. Chinese manufacturers are now being forced to import zinc for use in cars, household appliances, paints, rubber products and smartphones. The QualityStocks Daily Newsletter would like to spotlight Players Network, Inc. (PNTV). Today, Players Network, Inc. closed trading at $0.0567, up 5.00%, on 2,326,409 volume with 59 trades. The stock’s average daily volume over the past 60 days is 1,859,556, and its 52-week low/high is $0.0023/$0.0738. Players Network, Inc. (PNTV) is a diversified holding company operating in marijuana and media. PNTV owns 86% of Green Leaf Farms Holdings, LLC (Green Leaf Farms) which has Nevada state-issued cultivation and production license(s). The cultivation license enables Green Leaf Farms to grow marijuana and the production license enables them to create extracts which are used for cartridges, oils and edibles. WeedTV.com is a wholly owned subsidiary which is developing the ultimate resource for the marijuana lifestyle. PNTV has been a fully reporting, publicly traded company since 1998. WeedTV.Com is a niche social network and lifestyle channel destination for the marijuana industry. They are developing the "go-to" source for information, entertainment, products and services for people who relate to the marijuana lifestyle and an active social community. WeedTV.com features daily stories sourced by WeedTV.com correspondents and contributors from around the world. Programming includes, political news, business news on the industry, financial analysis from industry experts, growing tips, cooking tips, the "Weed101" section, medical applications/issues, lifestyle features, and entertainment specials. WeedTV.com's first original series is titled "High Stakes." High Stakes was developed by Michael Berk, the company's Chief Creative Officer and creator of one of the most popular cable series of all time, Baywatch. High Stakes is docu-series that follows the team at Green Leaf Farms as they build their facility and launch their marijuana business. The QualityStocks Daily Newsletter would like to spotlight India Globalization Capital, Inc. (NYSE: IGC). Today, India Globalization Capital, Inc. closed trading at $0.40, up 2.56%, on 93,259 volume with 290 trades. The stock’s average daily volume over the past 60 days is 420,184, and its 52-week low/high is $0.19/$0.80. India Globalization Capital, Inc. (IGC) is a first mover in developing a portfolio of products using cannabis-based "combination therapies" for the treatment of pain and other conditions. The national cost of health care due to pain ranges from $560 billion to $635 billion. In addition, the health care cost attributed to the abuse of prescription opioids, closely related to pain, is approximately $25 billion. IGC's patent filing (IGC-501) is a cannabis-based formulation addressing neuropathic and arthritic pain in joints and muscles using a variety of delivery techniques. The Company anticipates commencing clinical trials, and hopes that through its focus on combination therapy it can formulate and commercialize cannabinoid compounds as an alternative to long-term addictive opioid treatments. The Company has also filed combination therapy formulations for the treatment of epilepsy and cachexia. About 50 million people worldwide are affected by epilepsy and about 1.3 million in the U.S. experience cachexia associated with cancer, MS, Parkinson's, HIV/AIDS and other progressive illnesses. Cancer-induced anorexia/cachexia is responsible for 20% of all cancer deaths. IGC-502 indicated for seizures and IGC-504 indicated for cachexia are unique combination therapies that, if proven out by clinical trials, are expected to treat medical refractory epilepsy and eating disorders respectively, with lower side effects than conventional mono therapies. IGC's strategy is exciting and unique in that it is aiming to become a leader in the phytocannabinoid-based combination therapy specialty pharmaceutical sector. This first mover advantage can potentially be formidable as it begins clinical trials and further builds its patent portfolio. "The development of combination therapies utilizing cannabis represents a large, unique opportunity in this emerging specialty-pharmaceutical sector. Securing FDA approval for combination therapy is believed to be significantly faster and less expensive than new drug applications. As a result, we believe that we can bring our cannabis-based pharmaceutical products to market in both an expeditious and cost-effective manner," stated Ram Mukunda, CEO. IGC has recently exited its legacy businesses and currently holds international investments in land and in a hotel project. An impressive and experienced team, led by Mr. Ram Mukunda, CEO, directs IGC. Mr. Mukunda holds degrees in Electrical Engineering and Mathematics from the University of Maryland (UMD). He founded and served as Chairman and CEO of Startec Global Communications, an international telecommunications carrier focused on providing voice over Internet protocol (VOIP) services to emerging economies. Startec, the first pure play international long distance carrier, went public on NASDAQ. He has won a number of awards, including the 2013 University of Maryland International Alumnus of the year award. Mr. Mukunda serves as an Emeritus member on the Board of Visitors at the University of Maryland, School of Engineering, and has served as Council Member at Harvard's Kennedy School of Government, Belfer Center of Science and International Affairs. Mr. Mukunda and Dr. Krishna are the originators of all the IGC patent filings.